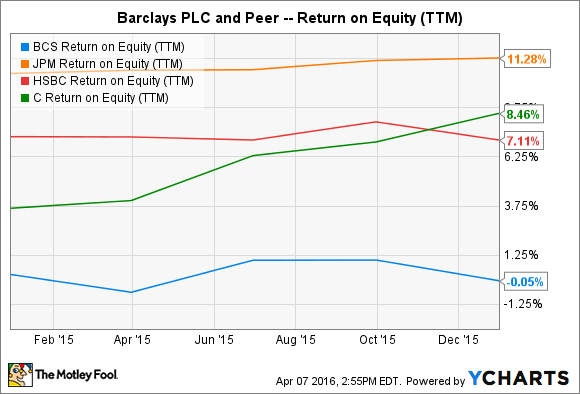 How Safe Is Barclays PLC Stock? Barclays stock is dirt-cheap for good reason. The question, then, is if it's cheap enough to mitigate the bank's many risks as an investment. All stock investments come with some element of risk. No one can predict the future -- particularly for stocks on the ropes, like Barclays PLC (NYSE:BCS) is today. However, that risk can be minimized with an acceptable margin of safety in the stock's valuation. Does Barclays have an acceptable margin of safety today, or is this British bank too risky for a Foolish value investor like you? Let's dive in. What is a "margin of safety," anyway? A margin of safety is when a stock is priced below what the company is actually worth. Famous value investors like Warren Buffett and Benjamin Graham call this the company's intrinsic value. You can think about it in simpler terms, like this: With a margin of safety, your goal is to pay $0.80 to buy a $1 bill. The $0.20 difference gives you a little buffer when making the purchase, so that even if you have to sell your dollar bill for $0.90, your investment still makes money. The hard part is, of course, determining if a stock's valuation is in fact different from the company's intrinsic value. For Barclays, understanding its margin of safety starts with how the market is valuing its stock compared to its peers. For bank stocks, the price to book value ratio is a common measure to compare valuations. BCS Price to Book Value data by YCharts. All of the comparable bank stocks here trade for less than book value, with JPMorgan Chase (NYSE:JPM) coming in only a hair short. As a rule of thumb, a bank stock trading below its book value is considered cheap. Citigroup (NYSE:C) and HSBC Holdings PLC (NYSE:HSBC) each trade around 0.6 times their respective book values. 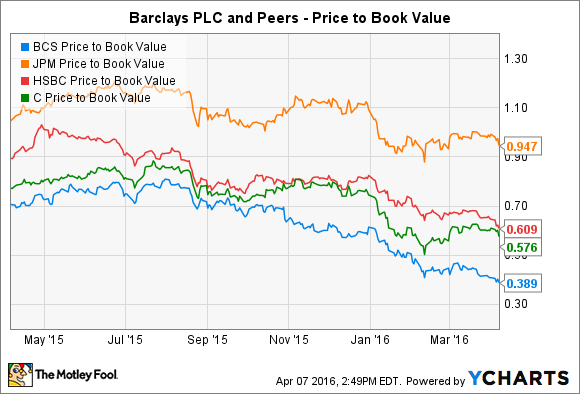 Barclays' price to book ratio is far lower, at less than 0.4 times book value. In conventional terms, these levels are not just cheap -- they're dirt cheap. Why has the market priced in this huge margin of safety? The reason Barclays trades at such a low valuation is pretty straightforward. The bank's profits have been abysmal over the past few years. Using each bank's return on equity on a trailing-12-month basis, it's clear the market is punishing Barclays for its bottom-of-the-barrel numbers. BCS Return on Equity (TTM) data by YCharts. Beyond the clear weakness in profits, Barclays has also been a routine figure in the news for all the wrong reasons. Regulators unearthed collusions between Barclays and numerous other international financial institutions to rig interest rates around the world. The falsified rates were first used as early as 2005 to improve the bank's trading positions, but were later manipulated to hide the bank's financial woes during the financial crisis. For its part, Barclays was fined £284 million, the largest fine in UK history. The bank's chairman and CEO at the time, Marcus Agius and Bob Diamond, respectively, were forced to resign over scandal. Diamond's replacement, Antony Jenkins, was unable to overcome the crisis, eventually being fired in July of 2015. Since Jenkins was fired, Barclays stock has lost over 54% of its value. Over the same period, Citigroup has declined 33%, HSBC 37%, and JPMorgan 18%. These declines are all significant, but the drop in Barclays' value is particularly so. However, as investors, we have to remember to look at what the future holds without becoming overly beholden to the past, however ugly it may be. I think this decline is an overreaction, giving investors today an attractive margin of safety, even in light of Barclays' next-to-nothing profits. The recent past has been ugly. No one will argue that. However, Barclay's new CEO is making major changes across the bank, and I think the future looks brighter than ever. Barclays PLC is doing everything right for the future. I think better results are just around the corner. Leading Barclays today is CEO Jes Staley, a protege of JPMorgan Chase CEO Jamie Dimon, widely considered among the very best bank CEOs today. Staley's strategy for Barclays is one of simplification, cutting costs, and building capital. It's right out of the Jamie Dimon playbook. Staley has set three major strategic priorities in financial terms. First, as shown earlier, the bank is seeking to improve its dismal returns on equity. To do this, it's focusing financial capital and human resources on its core businesses, ones that can grow and prosper without undue regulatory or financial risk. Second, the bank is focused on increasing its capital base, akin to the so-called "fortress balance sheet" made famous by Jamie Dimon. Barclays is selling its ownership stakes in non-core businesses and has announced a reduction in its dividend going forward. Both of these changes are designed to quickly build the bank's capital base without having to raise excessive levels of new capital that would dilute existing shareholders' stakes. Third, Staley is targeting the bank's poor efficiency. Barclays' cost structure is bloated compared to its peers, harming the bank's ability to improve profits and build capital. The bank's cost to income ratio was 69% for the 2015 fourth quarter. Staley has set an expectation for the bank to reduce that to below 60%. Not coincidentally, JPMorgan's fourth-quarter ratio was exactly 60%. A lower costs-to-income ratio indicates that it requires fewer operating costs for the bank to generate its revenue. These changes won't come cheap, unfortunately, at least in the short term. For example, Barclays announced plans to sell its retail bank in Italy last December. Just weeks after the announcement, the Italian banking sector fell victim to a massive sell off, lowering valuations for all players in that market. The bank was forced to book a $300 million loss on the transaction in the fourth quarter. This month the bank announced the sale of $15 billion in additional loans in the Italian market over the next two years. Taken altogether, I view Barclays PLC as an attractive turnaround story. The bank's stock is very cheap compared to its peers and well below its book value. That pricing is a result of poor performance in the recent past, but under the leadership of Jes Staley, the bank has a sound and proven turnaround strategy in place. Even if the turnaround takes longer than anticipated, or only partially succeeds, the bank's margin of safety is such that, to me, Barclays is about as safe as a turnaround can be at a major financial institution.